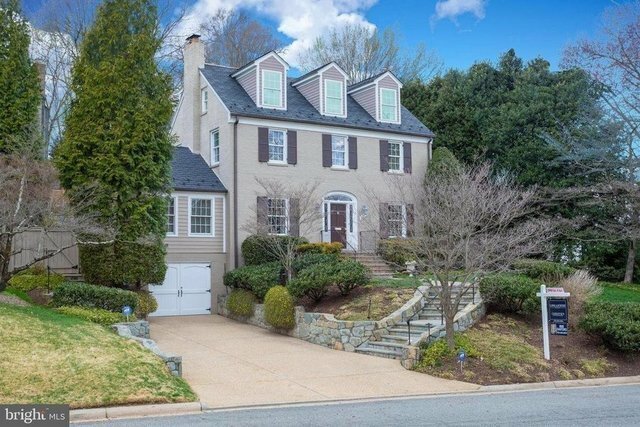 Elegant 6 bedrooms, 5 1/2 baths, 4 fireplace Home in COUNTRY CLUB HILLS is a show-stopper. New Roof 2019, Freshly Painted 2018-19, New Fence and exterior Lighting 2018, New Gas Range 2018, New Carpeting in Master, 4th Floor and Lower Level (Basement) 2019, Hardwoods refinished on Main and 1st Bedroom Level 2019, Will Not Disappoint! Upgrades ++ From the leaded glass transom and sidelights of the entry door to the hardwood flooring, wainscoting, detailed molding and trim work, the charm and character of the original 1940 home is tastefully blended with modern features. The updated parts of the home include a full Master Suite with Cathedral Ceiling upstairs, an open concept floor plan on the main level, and an expanded gourmet kitchen with step-down family room. The flow is seamless from the more formal spaces in the front of the home, through the open addition, to three sets of French doors in the back. These open to a lovely flagstone patio, tiered stonework, manicured gardens, and a level backyard. You are thereby perfectly situated for both casual and formal entertaining! On July 4th, invite friends to view Washington Golf's spectacular annual fireworks display from your front yard, just 1 1/2 blocks from the clubhouse. With 6 bedrooms, 5 1/2 baths, and 4 fireplaces, this graceful, one-of-a-kind home offers your family comfort and style all year round.